John Rudolph and Kate Quinn; Duets for Weddings and Engagement Parties. Click the picture to return to the Home page. John Rudolph and Kate Quinn have been happily married for nearly ten years now, so it's fitting that they would be able to sing duets for weddings and engagement parties. They have performed many notable love duets in public: "Bess, You is My Woman Now" from George Gershwin's "Porgy and Bess," "I loves you Porgy" from the same show, "All I ask of You" from the Phantom of the Opera, "So in Love," from Cole Porter's "Kiss me Kate," "Don't throw Bouquets at Me" from Rogers and Hammerstein's Oklahoma to name a few. Note: Kate plays the piano so she would accompany herself at parties provided there is a piano there. If not, she would bring a professional keyboard with her. 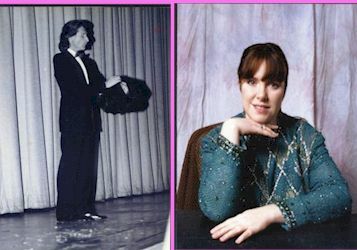 NOTE!Kate sings regularly with Melange Theatre Live, which will be performing on Friday, March 30th at The Rotunda, located on 4014 Walnut Street, Philadelphia, PA. Melange is a wonderful variety show in the tradition of Ed Sullivan that is seldom seen these days but a major treat! Kate Quinn normally sings two numbers, one operatic, one folk/rock, accompanying herself on the guitar! For more information about Melange Theatre Live, click here. For more information about "Planet Discord," the upcoming premier of Kate Quinn's Science Fantasy Musical, slated to be performed this weekend, February 17th and 18th, 2007, Click HERE. For more information on Kate Quinn as a composer, click HERE. Click here to email Kate Quinn. Click here to find out more about John and Kate.